The IFO diffusion index for March is unchanged. But the current conditions index rose to 29 from 27.3 while the expectations index slid to -9.8 from -8.5. And that mixed and thin gruel was enough for markets to boost the 10-year bund to a modest positive reading after it had turned outright negative last week. This turn of events tells us less about the strength of the IFO index than it tells us of the fragility of the state of the bond market. Normally markets are more keyed into the expectations for the IFO and ZEW surveys because they speak to the future. In this case, after an extremely weak set of readings from Markit on Friday, markets themselves were somewhat 'reassured' that the economy was not coming unraveled right now before their eyes as the IFO was able to bounce in March albeit that the bound is a very minor one (see Chart for context). 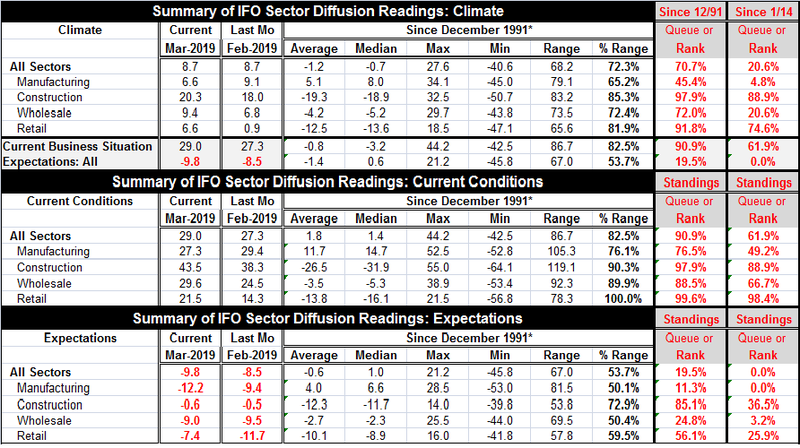 In the table below the two far right hand columns give an interesting perspective on what the current IFO readings mean. Judging the all-sector index on its ranking since January 2014, the standing is in its lower 20th percentile (weaker less than one-fifth of the time). But on a broader timeline, the current reading has a standing in its 70th percentile, higher only 30% of the time. On a recent 5-year timeline, the current all sector index is very weak, but viewed more broadly it is almost equally viewed as strong. What does THAT mean? We can see this in the chart where the IFO index is plotted above. The recent current conditions index is really hopped up compared to the past. So while it is now sliding and low by recent standards, the current index is still relatively strong by past standards! The current readings have been lower over of the longer period (that also includes a recession) and tends to boost the current rankings. The percentile standing shows that for current conditions the all sector index has a 61.9 percentile standing for the recent period, compared to a 90.9% standing for the longer period. And those two rankings span the gamut from moderate to quite strong; they are not very helpful in pinning down the state of the sector. But the expectations readings are weak for both periods. They are weakest for the recent period. But the expectation reading is still quite weak for the longer period with only a 20th percentile all-sector standing. It is when we blend the current and expectations indexes together that we get a reading with the maximum dissonance. Viewed separately, we can see current conditions are modest on one comparison or as still strong on another- but both readings show expectations as weak. If we follow this up to look at expectations by sector, we find some dissonance for construction and a bit for retailing as well. But manufacturing and wholesaling give more consistent weak readings in both periods. Month-to-month the expectations gauge weakened with two sectors posting exceptions. Wholesaling improved very slightly to a -9 in March from -9.5 in February. Retailing improved more substantially to a -7.4 reading from February's -11.7. In terms of the levels of the IFO reading, there may be a bit of dissonance in assessing this report. But in terms of the trend, there is a pretty clear signal. Moreover, expectations, looked at through just about any lens, are not reassuring. And the bounce in the IFO that markets have reacted to is a very minor event and one that bucks the trend of still weakening expectations. Is it a good idea to 'parse' the yield curve? We also have a number of Federal Reserve officials that have spoken in recent days and that is important given the key role of the Fed in setting the tone both domestically and globally. What we see are a number of current and former Fed officials who are changing their tune. The yield curve has moved up to become an important element that all Fed officials are taking about. But Fed officials are not panicking. Yet, for once, they appear to be focused on the behavior of the U.S. yield curve and may be ready to give it its due as a key policy parameter. We'll have to see how long that lasts. We can go back to the Estrella-Mishkin study of the yield curve (here). In that study (see the table on page 2), a minor inversion of the yield curve raised the probability of recession to 30%. An inversion of 50bp (in the 3-months to 10-year portion of the yield curve) would increase the probability to 40%. To raise the probability to 60%, the inversion has to progress to 113bp. To get to a 70% probability, it has to get to 146bp. We are still far from those metrics. But once the curve starts inverting, it can slip quickly. The market has been more interested in a binary signal than in these probabilistic gradations. And on that basis (yes/no! ), the simple fact of a curve inversion does perform well as a 'yes' signal. In other words, once the curve makes some inversion, it usually progresses enough to make a more severe inversion and to actually have a recession occur. Therefore, it is not clear to me that the Fed's downplaying of the fact of inversion is a sophisticated use of the Estrella-Mishkin result or a naïve unwillingness to admit that the Fed may have triggered a process that will end badly even though it is not at that stage yet. Is the Fed being sophisticated or is it in denial? In any event, if this ends badly for the U.S., it is not going to end well for Europe, China or Japan. So we are all U.S.-yield curve watchers now. If you did not realize how closely connected the global economy was before (and I count that as one of the Fed's biggest mistakes), you do now.